It was our 2005 trip to Crete that started me thinking this way. After the highlight of the trip, a stunning walk down the impressive Samaria Gorge, we caught a ferry to Loutro, a delightful village round a horseshoe-shaped bay which it is possible to access only by foot or by boat. 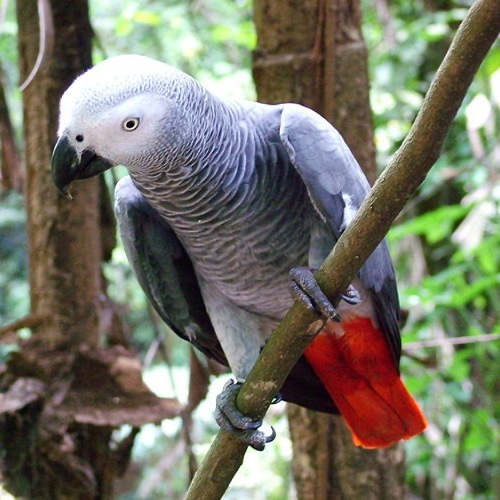 One of the bars sported a friendly Congo African Grey Parrot (right – the picture is from Wikipedia Commons courtesy of snowmanradio). What is the most striking feature of this bird? Quite so, it has a startlingly bright red tail. To me, the name seemed completely inappropriate. I would expect creatures to be named after distinctive features. The Americans, for example have a Red-winged Blackbird which is both black and has red flashes on its wings. The Americans have a Cardinal Bird which is, surprise, surprise, cardinal red. How descriptive. 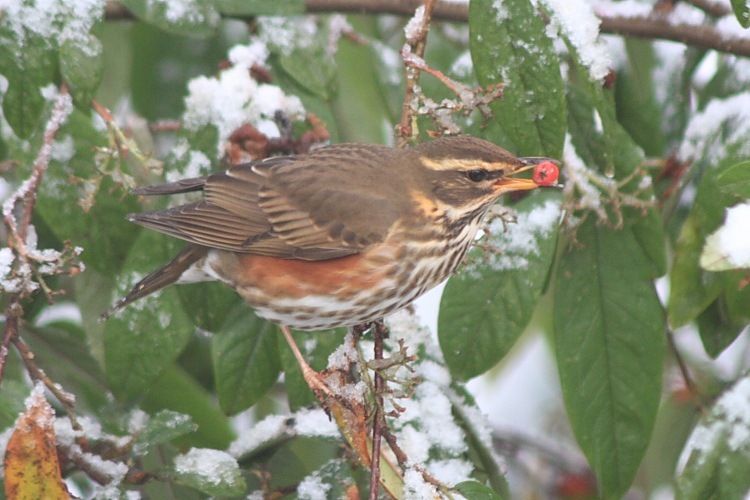 Recently, to our delight, our garden was invaded by our winter visiting, so-called Redwings. (Yes, I know – I’ve really had my money’s worth out of the Redwings. ) Do they have a red wing? No, they have a red armpit or flank under the wing but the wing is not red. They would more appropriately be called Redflanks or Red Armpits. I rather like Redflanks – it has a good ornithological ring to it. There are Redstarts, Redpolls, redheads, and Redshanks; why not Redflanks? Anyway, our Redflanks/Redwings have all moved on because the red berries (yes, they are both red and berries) have all been eaten. 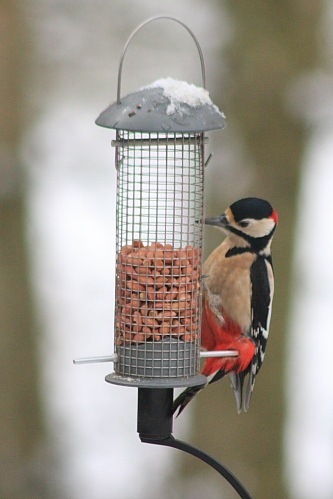 A regular visitor to our bird feeders is the very striking Greater Spotted Woodpecker. These beautiful birds nest in the Silver Birch trees out the back and we frequently have two or three in our garden at any one time. Is it spotted? No, not really; striped perhaps but not really spotted. Again, the most distinctive feature of both sexes seems to be a bright red lower belly, sort of under the tail. “Greater” is fine because there is also a smaller Lesser Spotted Woodpecker which, incidentally does not have the red lower belly. What a strange name to choose. 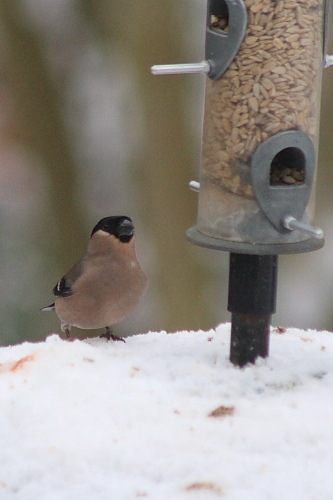 This week, again to our delight, we have been seeing another unusual visitor to our garden: Bullfinches. Why is this bird called a Bullfinch? Look at it; the male’s most distinctive feature is a fabulous red breast. Were I female I would probably know precisely what shade of red (cardinal, vermilion, scarlet?) but I’m male so red is red and red will have to do. Why is it not a Redfinch or a Red-breasted Finch? 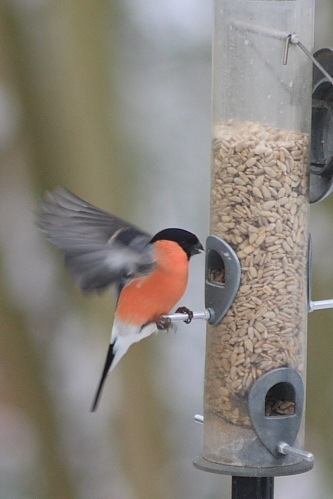 Wide though our selection of garden birds is, we don’t usually see Redfinches/Bullfinches. The female is, of course, more subdued but still a very handsome bird and we are very happy to have seen them. Incidentally, given that we’re stuck with Bullfinch, shouldn’t the female be a Cowfinch? A female Peacock is a Peahen, after all.